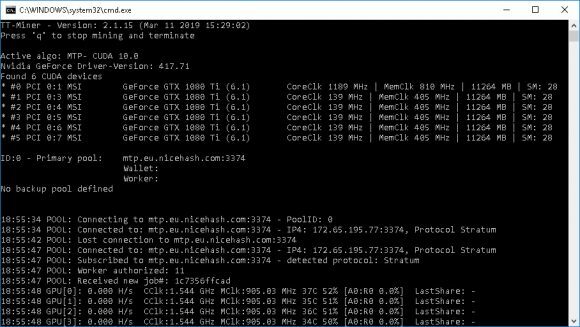 The latest TT-Miner Version 2.1.15 comes with improved support and performance for ZCoin (MTP algorithm) mining on NiceHash and that makes it attractive for use on NiceHash at the moment where MTP is among the most profitable algorithms. 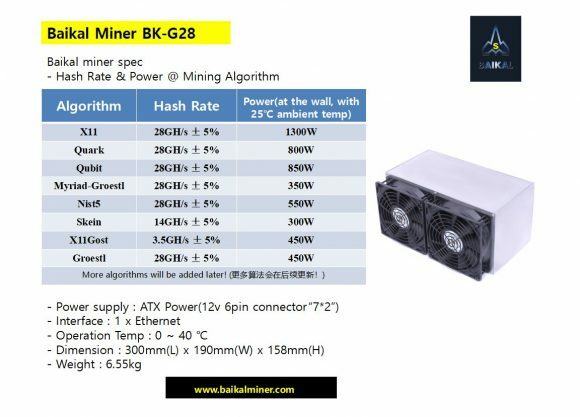 The expected performance is up to about 3.5 MH/s for GTX 1080 Ti and stability wise things seem good, though direct mining of ZCoin might also be worth it long term. It is interesting to note that other popular miners with MTP support are still lacking support for NiceHash mining, so the latest TT-Miner might still be the best option you have, not to mention that performance wise it could also be currently the fastest miner for MTP thanks to the latest optimizations. TT-Miner supports ProgPOW, Ethash, UBQhash, MTP and Myriad-Groestl algorithms on Nvidia GPUs and is available for Windows only, a closed source miner with 1% developer fee for all of the supported algorithms. 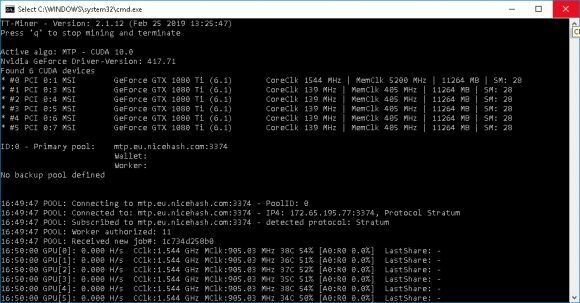 The latest TT-Miner Version 2.1.12 that has just been released comes with support for ZCoin (MTP algorithm) mining on NiceHash following the recent addition of MTP on NiceHash with very limited support miner wise. 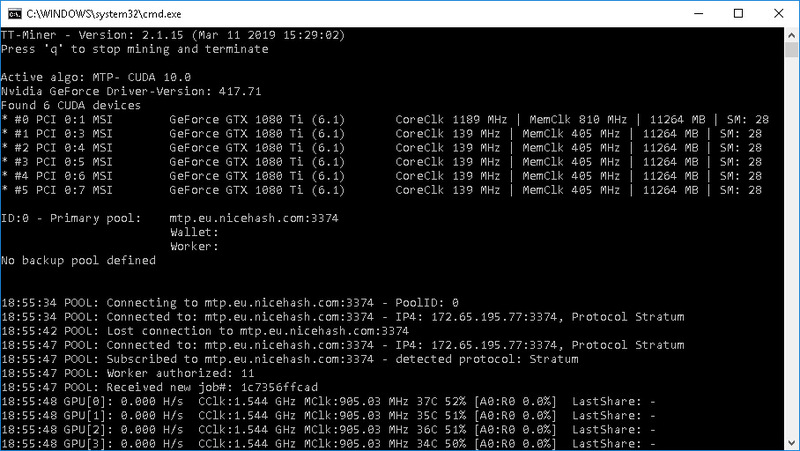 With the performance of about 3.3 MH/s for GTX 1080 Ti we are seeing it is profitable on NiceHash at the moment, so you might want to give it a go. 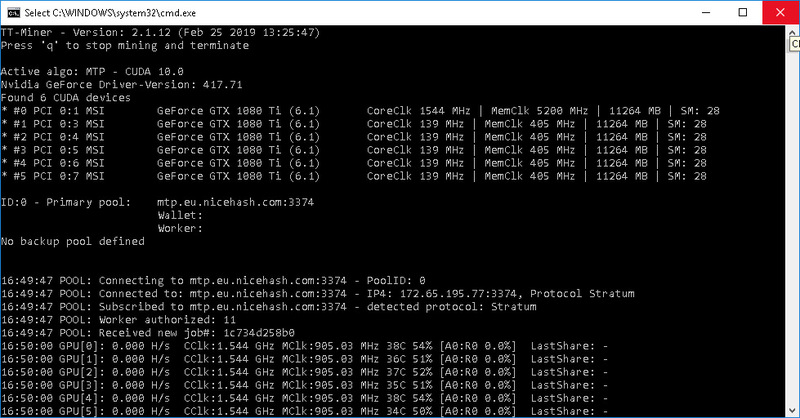 TT-Miner seems more stable and problem free compared to the ccminer fork with MTP support on NiceHash that was initially made available by NiceHash to use with their service after the initial announcement of MTP support. TT-Miner supports ProgPOW, Ethash, UBQhash, MTP and Myriad-Groestl algorithms on Nvidia GPUs and is available for Windows only, a closed source miner with 1% developer fee for all of the supported algos. Currently the miner has support for mining MTP and Ethash on NiceHash, though MTP support is probably what makes it the most interesting at the moment.